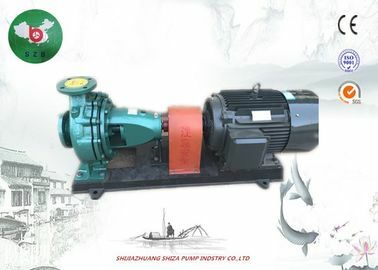 IS type centrifugal pump is a single-stage single-suction centrifugal pump, which is used for conveying clean water or other liquids with physical and chemical properties similar to clean water at a temperature not higher than 80 °C. IS centrifugal pumps are suitable for industrial and urban water supply and drainage and farmland drainage. 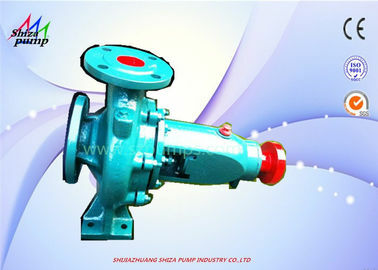 ISR type hot water centrifugal pump is a type of centrifugal pump derived from IS type. 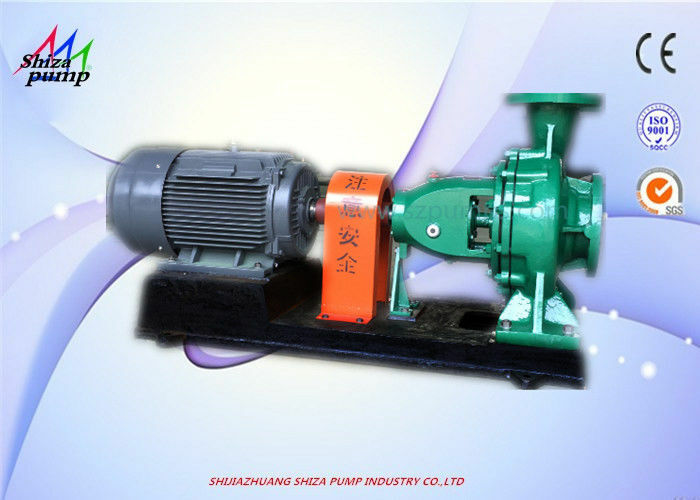 Its performance, curve and installation size are the same as those of IS pump. It is used to transport clear water or liquid with physical and chemical properties similar to clean water. The temperature is not higher than 150 °C. The pressure is 1.6pa, which is suitable for industrial and civil construction, such as metallurgy, power station, textile, chemical, printing and dyeing, ceramics, rubber, heating, waste heat utilization, air conditioning, etc. From the motor fan side, the Rotation direction od the pump counterclockwise. 1. The IS type single-stage single-suction centrifugal pump is designed according to the performance and size specified in the international standard ISO2858. It is mainly composed of pump body, pump cover, impeller, shaft, seal ring, bushing and suspension bearing. 2. 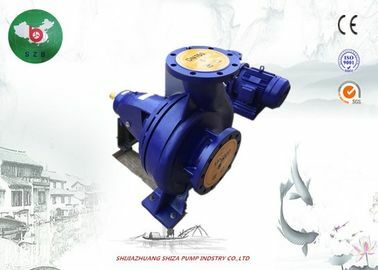 The pump body and pump cover part of the IS type single-stage single-suction centrifugal pump are divided from the back of the impeller, which is commonly referred to as the rear door structure. The utility model has the advantages that the maintenance is convenient, the pump body is not moved during the maintenance, the suction pipeline, the discharge pipeline and the electric motor are removed, and only the intermediate coupling member of the extension coupling is removed, and the rotor portion can be taken out for maintenance. 3. The pump housing (ie pump body and pump cover) forms the working chamber of the pump. The impeller, shaft and rolling bearing are the rotor of the pump. The suspension bearing component supports the rotor portion of the pump, which is subjected to the radial and axial forces of the pump. 4. 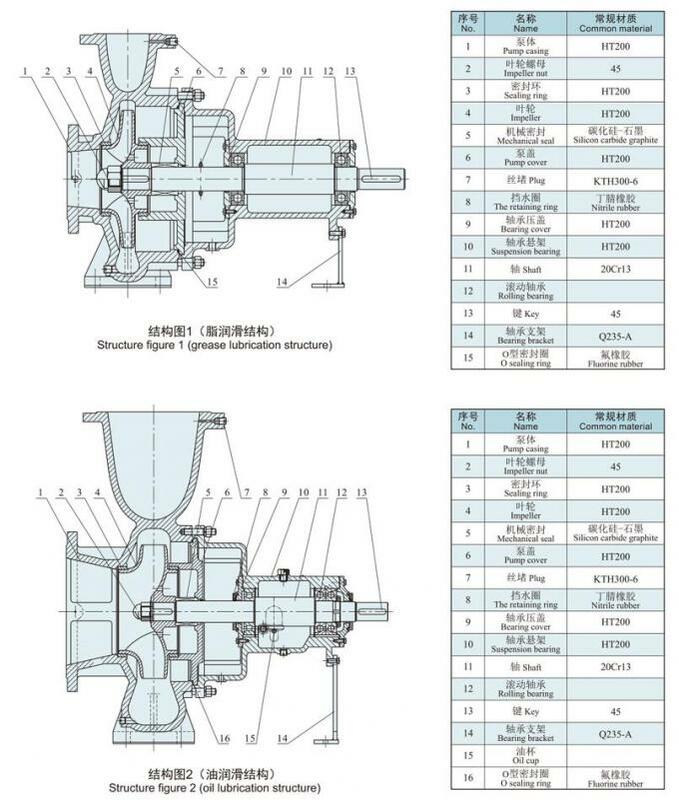 In order to balance the axial force of the pump, most of the impellers of the pump are provided with a sealing ring at the front and the rear, and a balance hole is arranged on the rear cover of the impeller. Since some pumps have little axial force, the back of the impeller is not sealed. Ring and balance hole. 5. The axial seal ring of the pump is composed of packing gland, packing ring and packing to prevent air intake or a large amount of water leakage. 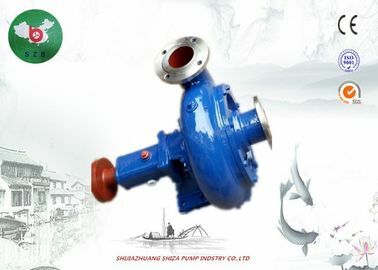 If the impeller of the pump is balanced, the cavity with the soft packing is connected to the suction port of the impeller. If the liquid at the inlet of the impeller is in a vacuum state, it is easy to enter the air along the surface of the sleeve. Therefore, a packing ring is inserted in the filling chamber. A small hole in the pump cover guides the pressurized water in the pump chamber to the packing ring for sealing. If there is no balance hole in the impeller of the pump, since the liquid pressure on the back of the impeller is greater than atmospheric pressure, there is no gas leakage problem, so the packing ring may not be installed. 6. In order to avoid shaft wear, bushing protection is provided at the part of the shaft passing through the packing cavity. An O-ring seal is provided between the sleeve and the shaft to prevent air intake or water leakage along the mating surface. 7. 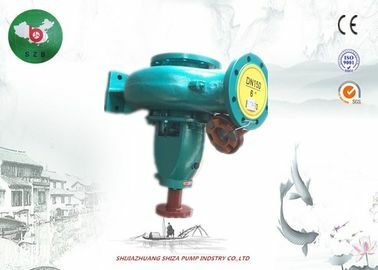 The transmission mode of the pump is connected with the motor by lengthening the elastic coupling. The rotation direction of the pump is rotated clockwise from the driving end.